Marble patterned non-porous vinyl surface is permanently bonded to a double-thick sponge base with bevelled edges for comfort and safety. Nitrile rubber composite sponge base offers maximum comfort and resistance and will inhibit the growth of contaminants. 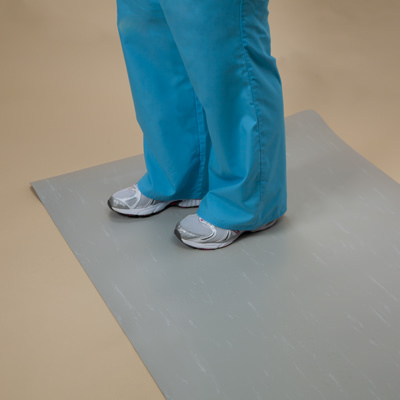 7/8” thick mats are stocked in two sizes – 3’L x 2’W and 5’L x 3’W. Black, Blue and Grey are in stock and ready for shipment. Other sizes can be custom ordered. Allow an extra three weeks for shipping. Contact our Customer Service Department for ordering.